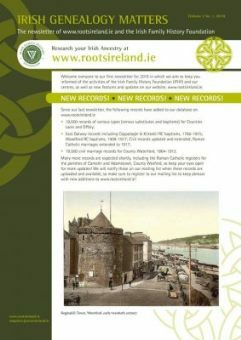 The Irish Family History Foundation (IFHC) has published the latest edition of its newsletter, Irish Genealogy Matters. Among the new records lined up to join the RootsIreland.ie database shortly are Roman Catholic register transcriptions from the parishes of Camolin and Adamstown in County Wexford. The newsletter also brings news of recent research successes and upcoming conferences/tours and other events across the island involving the IFHC network of genealogy and heritage centres. There are also details of some new books that may be of interest to researchers.